3 May 2017 – With much celebration, 2017 marks the ten year anniversary of the beginning of the partnership in supply between NOJA Power and the Chicopee Electric Light (CEL) Company. For a decade, the good people of Chicopee Massachusetts have been afforded a safer, more reliable electricity network forged on this relationship dedicated to improving the quality of electricity supply and the safety of its operators. For Chicopee Electric Light Company, the decision was easy to make as NOJA Power had proven themselves over many years in thousands of installations all over the globe, but the attention to detail which CEL witnessed in NOJA Power’s products demonstrated that this organization is dedicated to developing the safest and most reliable switchgear in the world. Together we celebrate our achievements in this decade, and look forward to the bright future of growth and innovation in the name of maintaining the US Electricity network as the world standard for safety, reliability and technology. Utilities in the United States have a proud electrical distribution heritage, as their forefathers developed not only distribution reclosers, but the entire distribution network itself. With this pedigree of knowledge, Chicopee’s engineering staff are certainly well enough equipped with knowledge to pass a heavily critical eye over the equipment and make a sound judgement as to its value for the purpose. Through a critical evaluation phase, Chicopee Electric Light were so impressed by the innovation and technology on offer in the NOJA Power recloser. But it was not only the features that the recloser offered, it was the motivation behind why this product existed. For many years, high voltage electricity offers one of the most dangerous and challenging workplaces for Americans to join. Here was a company that was dedicated to continuous improvement, to take an American invention and offer their contribution to a great idea, to further enhance the safety and productivity of the American network. It stands to reason then that the engineers of Chicopee Electric Light were confident in their acceptance of the product, as they understood that this was a partnership which sought to grow the safety and reliability of their network. Not just for the immediate time, but for the long term investment, growth and innovation that this partnership would bring. 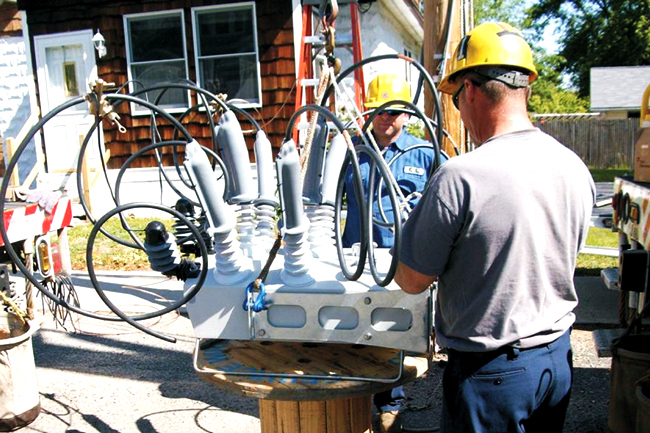 Following the placement of that initial purchase order through the American representative firm of the Northeast Power Delivery Group, NOJA Power immediately held up their end of the bargain, dispatching engineers and technicians to Chicopee, MA to train the operators and engineers on their new equipment. NOJA Power understood the importance of this step, assisting the Chicopee Electric Light company in making the most of their investment, despite the fact this investment was a third of the price of equivalent products. This support to CEL has been unwavering, as the relationships which were created a decade ago have continued, with NOJA Power only a short email away from solving any challenges in the field. This dedication to service and continuous improvement is something that both Chicopee Electric Light and NOJA Power share in common. Together they have removed the need for SF6 gas on their network, deploying the very first Solid Dielectric insulated Recloser system which has arc fault venting. When the status quo was to deploy traditional reclosers, NOJA Power enabled CEL to deploy equipment which had no risk of violent explosion due to electrical faults. For the very first time, the operators at CEL and the general public of Massachusetts had no reason to worry about the switchgear that was charged with keeping them safe and online. NOJA Power Group Managing Director Neil O’Sullivan reports, “We are proud of providing reliable product and service and support to the Chicopee Electric franchise over the last decade. We look forward to continuing to service them with leading edge technology products over the next decade”. April 2017 marks a new order date, as a further shipment of NOJA Power Reclosers is on their way to serve Chicopee Electric Light and the people of Massachusetts. CEL and NOJA Power are continuing their partnership in working together to a brightly illuminated future, tackling the challenges of integrating automation and renewable energy. Through this collaboration, they are working toward continuing the proud legacy of the US electricity system, paying homage to the inventors of electricity reticulation and continuing to make the US grid the World Standard for Safety and Reliability. In the 10 years that NOJA Power and CEL have been serving the people of Chicopee together, many other utilities across the United States have joined this cause. If you believe in the safety and continuous improvement of the distribution network, perhaps you too can contribute to the crusade for distribution network innovation together with NOJA Power.